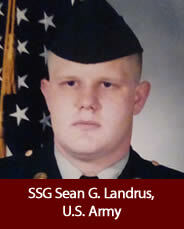 SSG Sean G. Landrus was born and raised in Thompson, OH. He was the youngest child of Kenneth and Betty Landrus and had three sisters and two brothers. He graduated from Ledgemont High School in 1991, attended Kent State University and worked at a couple of jobs before enlisting in the army in 1995. He did his basic training at Fort Leonard Wood in Missouri, was stationed in Germany, went to Bosnia and Kuwait and was stationed at Fort Riley, Kansas assigned to Company B, 1st Engr. Battalion, 1st Brigade Combat Team, 1st Infantry Div (Mech) before being deployed to Iraq in September, 2003. Sean was injured by a roadside bomb on January 27, 2004 and died from his injuries on January 29, 2004 which also killed three other members of his unit. Sean is survived by his immediate family, his wife Christina, children Khrista, Kenneth and Kennedy. He now has two grandsons Liam and Sean. Every year a golf scramble is held to raise scholarship money that is awarded to a Thompson/Montville (Geauga County) graduating senior.